There’s nothing better for a Disney fan than a vacation at Walt Disney World! But what to do when you’re looking for an island getaway that includes the service, characters, and quality that you expect from Disney? 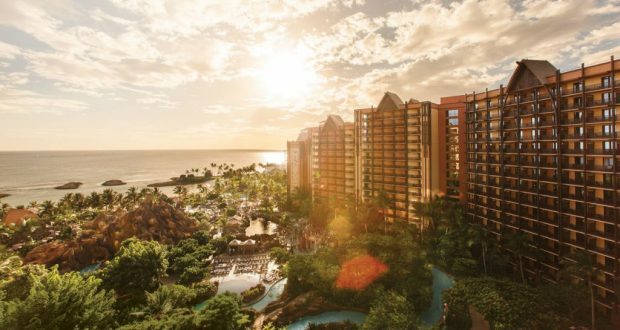 Look no further than Disney’s Hawaiian Resort, Aulani! Here are 10 things you should know about this fabulous vacation destination. 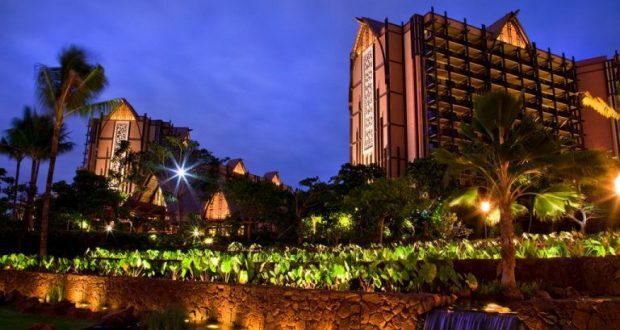 What is Aulani anyway, and how can you enjoy a Disney vacation without setting foot in Walt Disney World or Disneyland? Aulani is a Disney Resort and Spa located on the picturesque island of O’ahu in Hawaii. It’s a Disney Vacation Club resort, but it’s also possible to stay here if you’re not a DVC member. Aulani is a great choice if you love Disney but aren’t looking for a vacation in the parks; there are magical Disney touches everywhere throughout the resort, and fun for the whole family, but a theme park, it is not. Aulani offers so many exciting activities that you’ll never miss the theme parks. Make sure you take advantage of as many of them as possible during your stay! You can explore on horseback or by catamaran, or play a round of golf at Ko Olina Golf Club (after 3:00 pm, kids play for free!). Try your hand at the Hawaiian art of kapa printing and create your own special t-shirt, or take a guided walking tour to enjoy the local flora and fauna. You can even check out life under the sea by snorkelling in the resort’s Rainbow Reef Lagoon. At Aulani Resort, there are a variety of accommodations available, from the affordably comfortable to the extravagantly luxurious. Rooms, suites and villas are all available, and ready to make you feel at home whether you just need a cosy room for two, or a spacious home-away-from-home where you can cook your own meals and entertain friends, family, or business associates. Whichever you choose, your accommodations will be beautifully appointed, full of subtle Disney touches and Hawaiian style. Sure, O’ahu is surrounded by water, and you can enjoy a number of watersports in the ocean. But if relaxing poolside is more your speed, you have plenty of options to choose from! 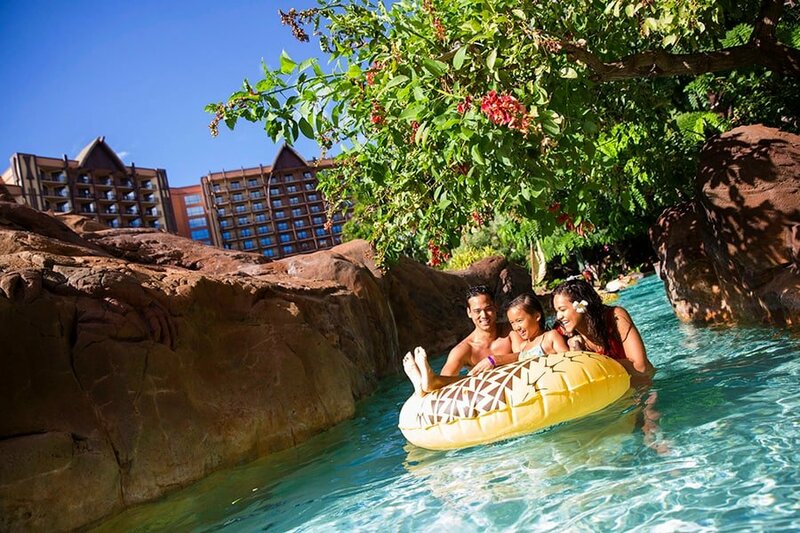 Aulani offers a gorgeous infinity pool called Ka Maka Grotto, overlooking the beach, and the adults-only Wailana Pool is a tranquil escape for those 18 and over. Waikolohe Pool is the biggest pool on site, and includes lots of family fun including pool parties and a water slide, and kids can while away the day at the interactive Keiki Cove Splash Zone. And don’t forget Waikolohe Stream, where you can go tubing on a lazy river or try your hand in the rapids. Ever wanted to learn to play the ukulele? What better time than when you’re on vacation in Hawaii! Aulani offers 45-minute classes that cover the basics and teach you to play some chords to accompany yourself to popular songs. You can even buy your very own ukulele at the end of class! Classes are completely free, but they fill up fast, so make sure sign up right at 8 am the day you want to take the class. Because Hawaii is close to Eastern Asia, you’ll notice abundant Japanese details at Aulani that cater to these overseas visitors. You’re bound to see Duffy make frequent appearances (at character meet and greets and on merchandise), and the Asian influence is also evident in ‘Ama ‘Ama’s wonderful Japanese breakfasts, the rice cookers in the villa kitchens, and in the traditional Japanese eats at the buffet at Makahiki. Even if you’re on a family vacation, you may find yourself yearning for some “you time” (we recommend the couples massages and spa treatments, or a relaxing break in the adults-only pool) away from your little ones. Well, Aulani has you covered with Aunty’s Beach House! This is a child care center-slash-kids’ club on site where kids will have a blast meeting Stitch, taking part in arts and crafts, and learning to hula, among other fun activities. Book spots early, as they fill up fast. You can’t vacation in Hawaii without attending a Luau! 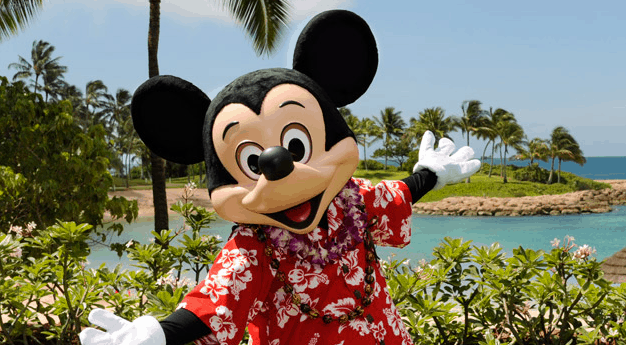 Everyone’s favorite mouse himself appears at Aulani’s Ka Wa’a Luau, an evening extravaganza that you won’t want to miss. Celebrating Hawaiian culture, food, legends, and natural beauty, Ka Wa’a Luau includes singing and dancing, traditional Hawaiian crafts (such as temporary tattoos and floral bracelet making), story-telling, and a dinner that truly deserves the name “feast”! You don’t have to be in Walt Disney World to meet your favorite Disney characters! Aulani features daily appearances by a multitude of characters including some you’d expect, like Moana and Stitch, but others you might not, including Chip ‘n Dale and Pluto. To keep yourself in the loop, call the Character Hotline (easy to reach using the phone in your room) to find out which of your favorites are appearing each day. You’ll have more than enough to keep you occupied at Aulani during your vacation, but you ARE in Hawaii, so we recommend taking a day to explore beyond the resort. It’s easy to rent a car or, if you prefer to relax and leave the driving to others, you can book a tour. O’ahu has lots of natural, historical and cultural attractions to explore, from swimming with turtles or sharks, to visiting Pearl Harbour, to hiking through lush rainforests.